Despite the Arduino YUN was presented just recently, already a new board that is compatible with GNU/Linux has been released. This one is based on x86 technology and made by Intel, the leader of this technology. Evolution of embedded technologies could be considered a fact if a giant like Intel decided to participate with his “interpretation” of the phenomenon. Embedded technology combines the power and flexibility of an operating system such as GNU/Linux and the ability to manage peripheral I/Os according to the typical specifications of the microcontroller, all made ​​with architectures equipped with one or more processors. 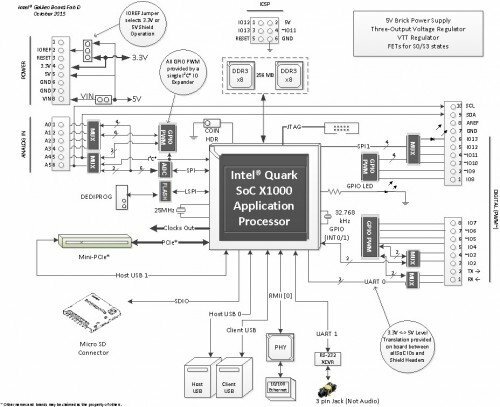 “Galileo” is based on the Intel Quark X1000 SoC, a system built around a 32 bit Pentium class processor, single-core, single-thread, compatible with ISA architecture (Instruction Set Architecture), which works at speeds up to 400 MHz. 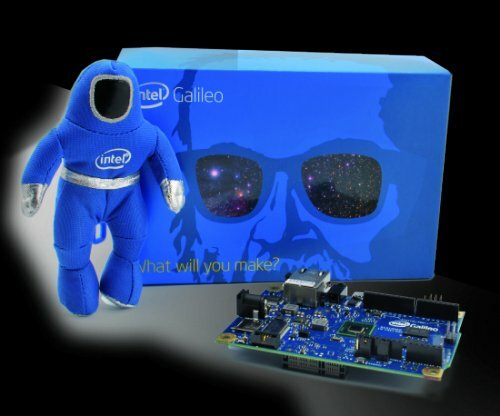 Galileo is the first Intel board designed to be hardware and software compatible with the specifications of Arduino Uno R3. De facto a small PC that you can assemble with shields designed for Arduino. The pinout is compatible with Arduino Uno, and the I/O terminals can work at either 5-V to 3.3 by placing a jumper, which activates the level converters for each pin. The native voltage is 3.3V, the 5V is obtained with the conversion. While “Galileo” is software compatible with Arduino’s IDE, the operating system is a GNU/Linux distribution, which “runs” on the board only processor. The Arduino sketches are run as processes in the user space of the GNU/Linux operating system. The available IDE compiles the sketches in “.elf” format, an executable binary format, originally developed by UNIX System Laboratories and commonly used in GNU/Linux. Being developed from a family of PC processors, the “Galileo” board has a whole series of connectors, bus and doors, typical of PCs standard, which are added to the classic Arduino’s devices. Look at the block diagram of the board: a mini-PCI Express connector, one 100 Mb Ethernet port, a slot for a Micro-SD, RS-232 serial port, a USB Host port and a USB Client port can be spotted. There is also a 8Mbyte flash NOR memory. Galileo requires a 5V supply by the coaxial power connector. In this regard there is a recommendation clearly highlighted in the Intel instructions: it is important to give power to the board by the power connector before connecting it to a PC for programming by USB cable, otherwise you could damage the board itself.